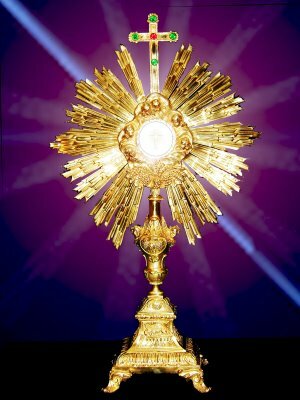 Today Roman Catholics across the globe observed the feast of Corpus Christi and that synchronized with the National Youth Sunday in the UK. For me, today’s feast was quite special into ways. On one hand was because it reminded me (and you also) of the distinction between an irreligious sort of dominion and that which Our Saviour and God holds as the crucified and risen God. On the other hand was because it marked the end of the Catholic liturgical year. Truly, in Catholic doctrine, today is like December 31st, last day in the year, and a fresh liturgical year begins next Sunday with the First Sunday of Advent. In essence, today marked the summary of the just concluded liturgical year. Interestingly, today’s gospel was a revelation of truth. A truth, that indeed Christ is a King and supreme over all things. This truth was revealed towards the end of the reading, John 18:33-38. We heard when Jesus said, My Kingdom is not of this world,” in response to Pilate’s question. Pilate himself couldn't stand the truth. This explains why Pilate worked away after he had asked Jesus, “What is truth?” and he (Pilate) confirmed this truth when he went out to the crowd and said to them, “I find in him no fault at all.” Thought provoking! Today’s feast harps on the truth about the Kingdom of life, Kingdom of peace, love and justice, Kingdom of grace and holiness. My take on today’s reading is that there are elemental truths about who we are and what we are called to do on earth. These truths start paramountly from the fact that we are made in God’s image, and that everything came into being through him. This reveals the truth about human dignity and sanctity of life, which we refer to as ‘Human Rights.’ We do not have those rights because they were given to us based on the bigheartedness of our governments, but rather we have those rights simply and fundamentally because we are human beings. Ramsey Clark’s quote that “a right is not what someone gives you; it’s what no one can take from you,” rightly confirms that. Sometimes the messages about God's Kingdom are not always clear and as such we are inclined often times to search for the truths to grasp them fully. Remarkably, is the truth about God, which has always been the bone of contention when Christianity comes in contact with other religions notably Islam. As Christians we are cautioned by today’s feast to ponder about our relationships with other religions in our pursuit for and understanding of the truth about God. The Catholic Church, for example, recognizes the need to foster better relations between people irrespective of their religion, and periodically re-examines its relationship with other non-Christian religions. This idea was presented in Nostra Aetate and has often times been reviewed. However, the punch line is that we have been given the signs of Kingdom of God and we have these signs within our reach. Therefore, we are expected to hold them in our arms and incorporate them into our daily lives. So when we talk about God’s Kingdom we are not to make references to time or place but rather to focus our torchlight on the space we create in our hearts and minds for God. That overall is about listening to God’s message, which in essence portrays the truth we search for. And the truth we search for is all about having an open and lively mindset, which implies tolerance and welcoming point of view. It overall implies listening, thinking, praying and reflecting.